This entry describes proteins of unknown function. 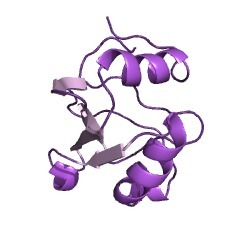 Structures for two of these proteins, YggU from Escherichia coli and MTH637 from the archaea Methanobacterium thermoautotrophicum, have been determined; they have a core 2-layer alpha/beta structure consisting of beta(2)-loop-alpha-beta(2)-alpha [(PUBMED:12975589), (PUBMED:11854485)]. There are 8584 DUF167 domains in 8582 proteins in SMART's nrdb database. Taxonomic distribution of proteins containing DUF167 domain. This tree includes only several representative species. The complete taxonomic breakdown of all proteins with DUF167 domain is also avaliable. Click on the protein counts, or double click on taxonomic names to display all proteins containing DUF167 domain in the selected taxonomic class. Resonance assignments for the hypothetical protein yggU from Escherichia coli. 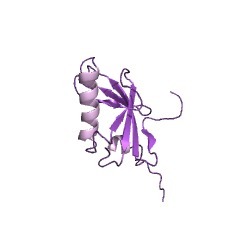 1n91 Solution NMR Structure of Protein yggU from Escherichia coli. Northeast Structural Genomics Consortium Target ER14. 1yh5 Solution NMR Structure of Protein yggU from Escherichia coli. 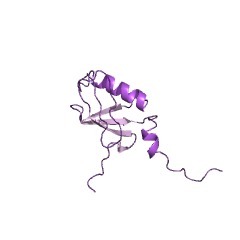 Northeast Structural Genomics Consortium Target ER14.